My heart is with Bernie Sanders, but my head says he (and the Democratic party) are doomed. When asked on Friday evening on HBO’s Real Time with Bill Maher about “the message” of the Democratic party he didn’t have a good answer. Until they figure out how narrative works, they are doomed. 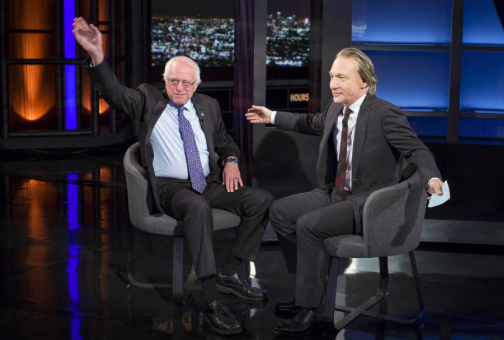 BERNIE SANDERS AND BILL MAHER BID FAREWELL TO THE DEMOCRATIC PARTY’S HOPES. Trump knows narrative. That was the title of my draft editorial that the publicist for my “Houston, We Have A Narrative” book submitted to a large number of newspapers in the fall of 2015 as everyone was busy laughing at Donald Trump. It was turned down everywhere — they already knew Trump didn’t stand a chance at the presidency. I was left telling about the Trump/Narrative theme the morning after the election on “The Business of Story” podcast. Two weeks ago on “Meet the Press” (May 27), Chuck Todd said, “… as President Trump showed once again how skilled he is at shaping a false narrative to his advantage.” He’s talking about “shaping narrative.” That’s what Trump knows how to do. And the Democrats don’t. What can be said about this? The Democrats are utterly, utterly inept at mass messaging, which means narrative. Here’s yet another article, just last week, with the same old headline of the Democrats, “need to have a message.” Over and over and over again it’s being said to them. My Democratic strategist friend Dave Gold had an excellent article in Politico last year laying it out clear as day — that Democrats are too much in love with polls and data, and too clueless about story/narrative. It’s now at crisis stage. HILLARY VERSUS BERNIE: QUIEN ES LESS MESSAGE SAVVY? CHUCK TODD: Bernie Sanders has been talking about a political revolution. A future you can believe in. Obviously, Donald Trump with the Make America Great again, is one of these slogans that has taken off, for better or for worse. If you could sum up, what is the big idea of your candidacy? SEC. HILLARY CLINTON: Look, we are stronger together. We are stronger together, in facing our internal challenges and our external ones. We are stronger together if we work to improve the economy. And that’s going to mean trying to get the Republicans to do what will actually help produce more jobs, like we saw in the 1990s. We are stronger together when we have a bipartisan, even nonpartisan foreign policy that protects our country. And that provides a kind of steady, strong, smart leadership that the rest of the world expects from us. I ended up seeing for myself how disinterested in messaging the Clinton campaign folks were when James Carville pulled all his strings (which were plenty) to try and get them to at least try working with my ABT Narrative Template, which I told about last year here. That was sad, but Bernie is no better. CAN YOU PUT IT ON A HAT? Look at this exchange last Friday evening. Bill Maher asked Bernie VERBATIM for “something that would fit on a hat.” Why couldn’t he answer him with a 4 word slogan? Donald Trump would have. BILL MAHER: … BUT an agenda is not a message. They are different. Trump is better at messaging. His voters don’t care about an agenda except build a wall, lock her up. What’s the Democrats message? If you had to boil it down to something that would fit on a hat, which is about all that people can take in at this point — what’s the Democrat’s message? BERNIE SANDERS: The Democrat’s message is that we need a government that represents working families not billionaires. (APPLAUSE) An agenda that says health care is a right not a privilege. An agenda that speaks to the young people that says that we should make colleges and universities tuition free and lower debt. Where was the slogan that fits on a hat? This is not silliness. Every facet of this country is now suffering the consequences of Donald Trump’s narrative skills. How bad does it have to get until the Democrats admit they have a fundamental problem with narrative in today’s information-glutted world? There’s your problem. It’s called “the singular narrative.” Trump eats it for breakfast as Democrats continue to argue back, “Well, it’s not that simple.” Yes, it has to be, or there’s no hope for you. 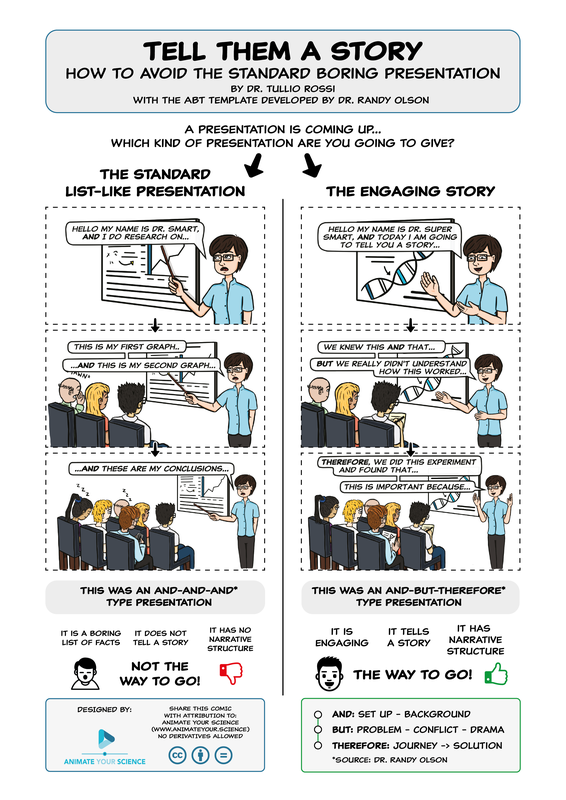 Last week Dr. Tullio Rossi of Australia posted this wonderful cartoon version of my ABT Narrative Template which so far has gotten several hundred retweets on Twitter. The rest is Trumpian history. Yes, it continues to be that simple. This is a battle that the over-educated are simply not equipped to handle. I started warning of this problem in 2009 with the first edition of, “Don’t Be Such A Scientist: Talking Substance in an Age of Style.” It’s incredibly frustrating to watch them continue to spin so aimlessly. And with no signs of change ahead.